We thank our volunteers who helped us put together this inaugural program and made it a grand success. Touch-A-Life Foundation, a non-profit organization to support homeless students, hosted a successful fundraising event on December 22, 2017 to benefit homeless students across the bay area. Backpacks, clothing, sanitation kits, and school supplies were provided to students in need through the McKinney-Vento/Foster Care program liaisons at the local school districts. The inaugural fundraising event took place at the Quinlan Community Center in Cupertino from 6pm to 10pm on Friday, December 22nd, featuring teens’ performances, art exhibitions, photography auction, inspirational speeches, and live music. Created by kids, for kids less fortunate, the event had more than 300 participants and successfully raised nearly $20,000. The event was supported by Solix Technologies and Emagia Corporation. Dinner and refreshments were served throughout the event by Pista House. 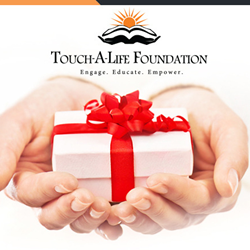 The Touch-A-Life Foundation is a non-profit organization (please view IRS approved exemption document 501(c)(3)), founded in 2012, to support homeless students. We are an organization that targets the needs of the students, and satisfies these needs to make their everyday routine as comfortable as possible. Our mission is to keep homeless students motivated to continue their education to college by helping them overcome daily resources issues. The Touch-A-Life Foundation is committed to supporting homeless students and their prosperity. By providing the students with everyday resources, promoting awareness to the general public, and educating them on the importance of higher education, we hope to ensure that the hardships these children have faced do not impede them from being successful in life.